Qualifying period : 1st July 2013 to 21st July 2013. The Think Blue. National Challenge 2013 will take place on 17th August 2013 to 18th August 2013. The Think Blue. World Championship 2013 will begin on 6th September 2013 until 10th September 2013 in Germany. An all-expense paid trip to Germany to represent Malaysia in the Think Blue. World Championship 2013. Online: Play Volkswagen's virtual game on Facebook / Mobile App. The "Think Blue. 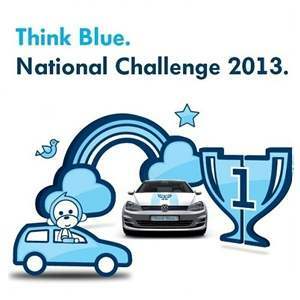 National Challenge 2013" Champion will compete in the "Think Blue. World Championship 2013" in Germany. Visit Think Blue. National Challenge 2013 contest page for more details.